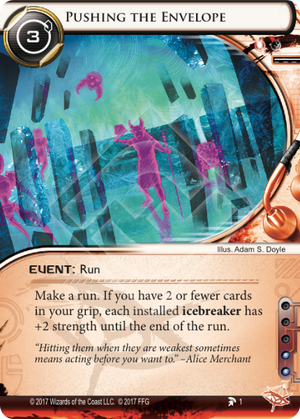 If the Runner draws cards so they have 3 or more in grip during the run initiated by Pushing the Envelope, do installed icebreakers lose the +2 strength? No. The ability of Pushing the Envelope takes effect when the event is played. If the Runner installs another icebreaker during a run initiated by Pushing the Envelope (e.g. Paperclip from heap), does it have +2 strength? Lean and Mean's anarch cousin. Unfortunately suffers from all the problems of Lean and Mean (see my review of that one) and adds some extra downsides: it's 1 more expensive, 1• more influence and it has a much harder condition. The latter is the biggest problem. Running with only 3 programs installed is doable. It's not perfect but in the right deck it's doable and it's perfectly safe. The biggest problem you'll have is running into traps but those generally don't kill you and the odd ice that can't be broken unless you have an AI (e.g. in a Excalibur / Off the Grid combination). I can get why the extra strength is appealing, if you're running Faust. But for Faust you want to have a lot of cards in your hand and that doesn't work with Pushing the Envelope. Faust decks often do not have more than 3 programs installed however so if you can spare the influence Lean and Mean is the much easier option. So, no, not a good card. P.S. FFG, is there any reason why the phrasing of Pushing the Envelope and Lean and Mean is different? It just needlessly complicates comparison by making us reviewers check for gotchas.